The Harsher, Deadlier //Dark Souls is also a More Beautiful Horror Adventure !!NEW!! 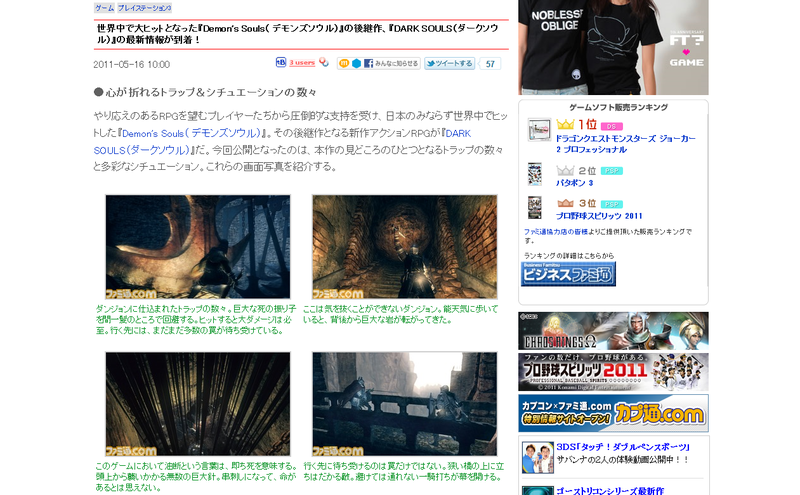 DARK SOULS（ダークソウル）』の最新情報が到着！<span style="color: #ff0000;"> !!NEW!! This page contains a reference list to all the information available on the game, we will continue to update this regularly as more interviews surface and content is released! "... but, in the end, the fire dies and only darkness remains. And now, the fire is indeed extinguishing, unable to reach the human world, and endless night ensues. Within people, the dark mark of a curse appears..."
The official website is short on words and high in graphic content, including a short trailer, and is available in both Japanese and English. "Hidetaka Miyazaki, director, Dark Souls: Dark Souls is not a sequel to Demon’s Souls by any means. However, it’s created by the same producers and director and so the ideologies, concepts, and themes have carried over and are similar. It’s a totally new game with similar concepts." "We are trying to create a game that is spicy. And we want to make it as spicy as possible. But it’s edible and tastes good and leaves you wanting more." "The main concept has not changed: You try something, die, learn from your mistakes, and eventually overcome those mistakes." "Throughout the game, there will be both cooperative and competitive play with other players. Each user will enjoy a unique single-player game; at times, they will cross paths with one another." "Hidetaka Miyazaki: ...I'm glad that it's not a direct sequel...because we don't have to be bound by the features, the game design, and the content of Demon's Souls. 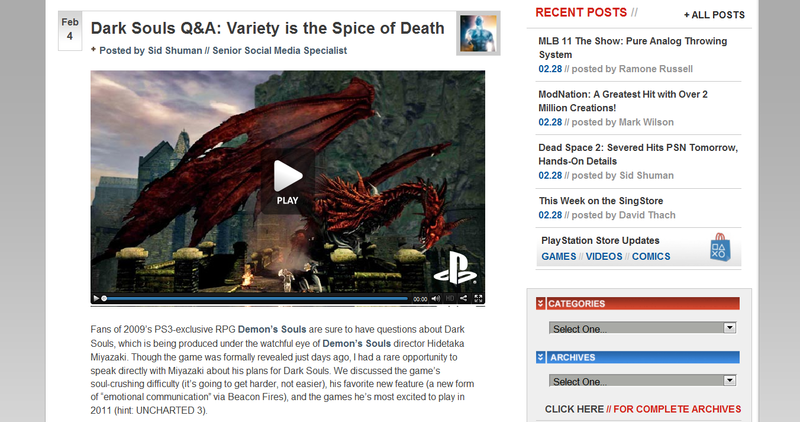 So we were able to try out new things, take the experience from Demon's Souls, and put it into a brand new game." "I want to express being strict. Life is not easy, you know. I wanted to express being in a devastating situation and being able to fight against it to try and succeed." "...The messaging system in the game--similar to the one in Demon's Souls--and the feelings you have from reading the messages is simply because you know that other people are facing the same difficulty." "But one thing I'm set on is to not make the game more difficult based on skill level. I don't want the users to necessarily have to be quick or necessarily have high-skill level in terms of how you control the game. That's not where we're trying to create the difficulty. What I'm trying to achieve is a game that anybody can clear. It may take time, but a player who is attentive, can strategize, and create their own game style…that's how the player will be able to complete the game." "Miyazaki said the game places focus on the feeling of exploration by making the map fully seamless." 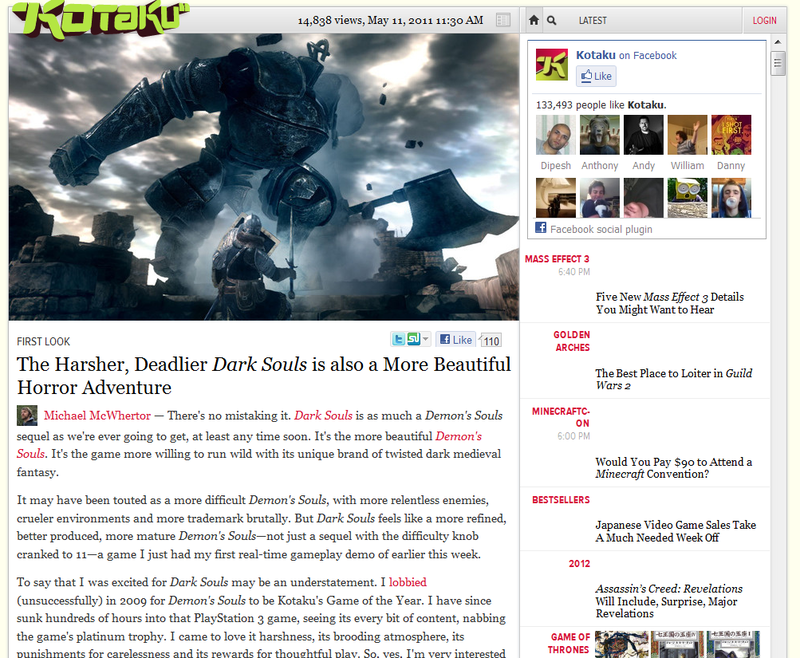 "Dark Souls is expected to have about 60 hours or so play time, said Miyazaki. Demon's Souls, in contrast, expects 30 or 40 hours. In the area of content, the major point of increase is in enemies. Demon's Souls had around 30 types. Dark Souls has close to 100." 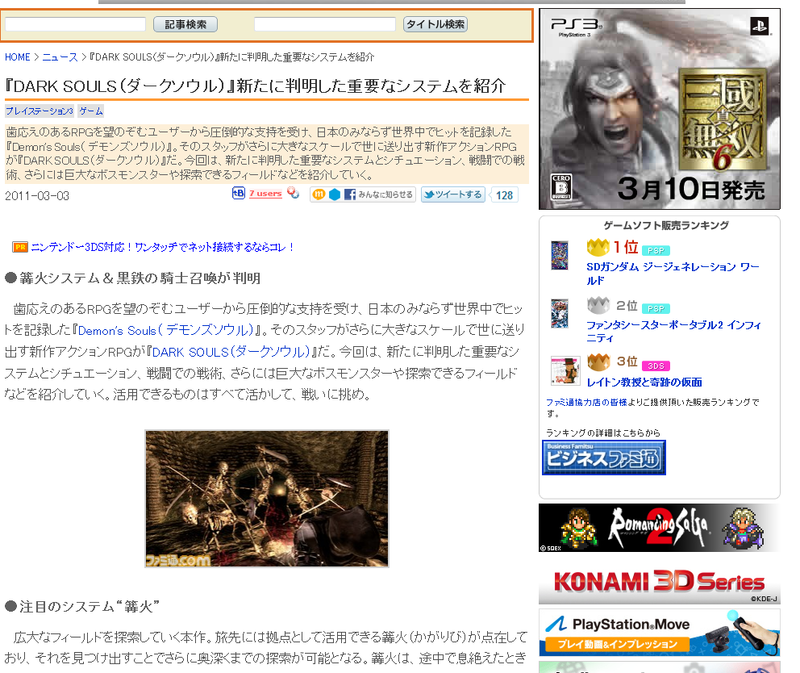 "From Software is handling promotions for Dark Souls on its own in Japan. Namco Bandai is doing that sort of work for international markets. 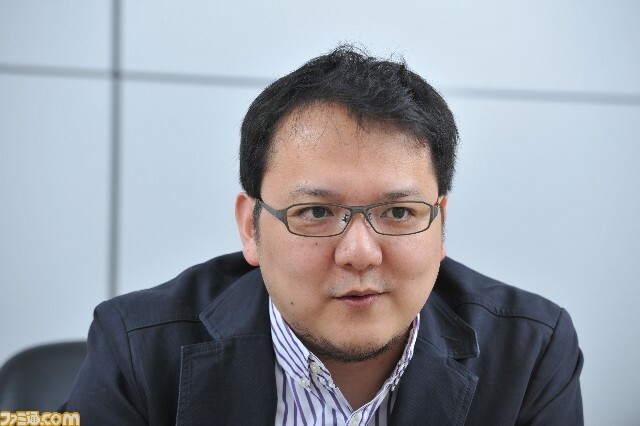 Miyazaki said that Namco Bandai's role could be described as collaborating on the game while also taking part in the game's worldwide strategy. From Software is responsible for all the game's content, though." "There are currently no plans in place for download content, although it's not something that has been completely ruled out." " Hitaka (Sic) Miyazaki: To clearly pose a sense of achievement to the players, we will most likely maintain the "one map plus boss" format. However, the game will not completely be structured in this way. " 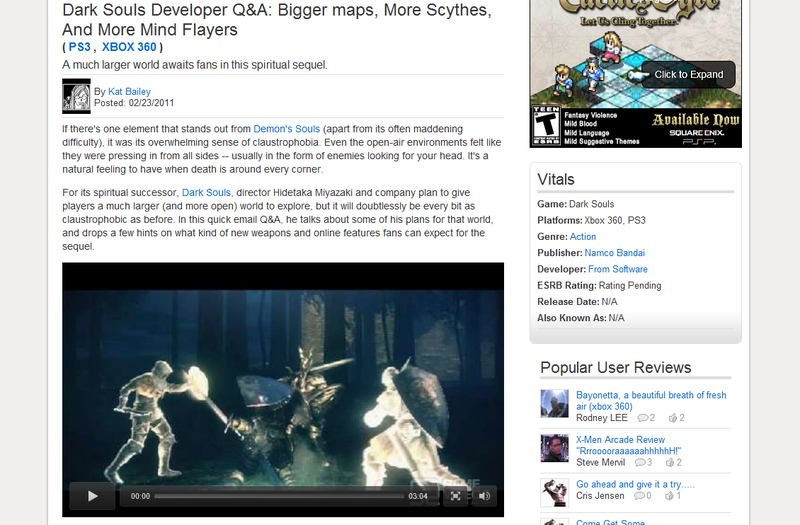 "...As compared to Demon's Souls, the map will be approximately 1.5 times the size. It may feel even bigger to the players." "... For Dark Souls, we will most likely not call the initial character settings and equipping "classes." 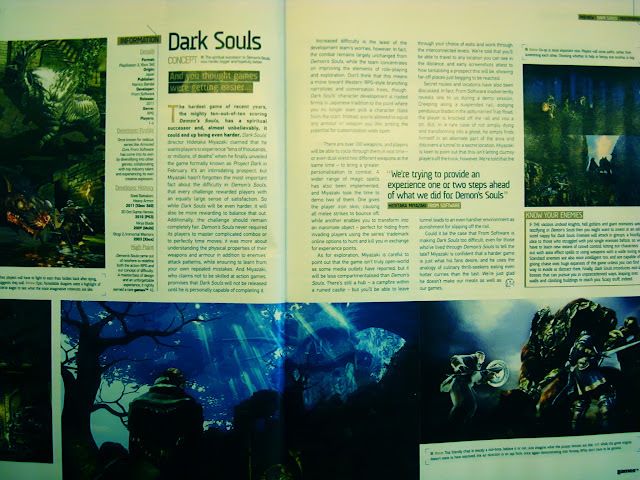 " ...There is little difference in terms of approach to the concept of a story from Demon's Souls." "For Dark Souls, we will be implementing several new online features, but there will not be one aimed specifically to replace "Soul Tendency." This game will use a new network system which does not utilize a specific server. We plan to provide a new online experience using this new method." 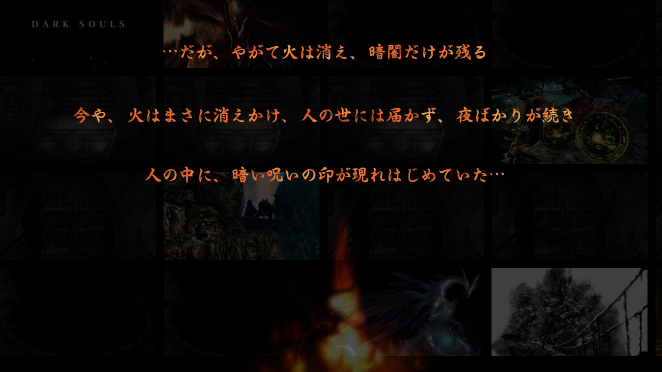 Hidetaka Miyazaki has a Sony digital frame in his desk, flashing 30-second of real user feedback on Demon's Souls. 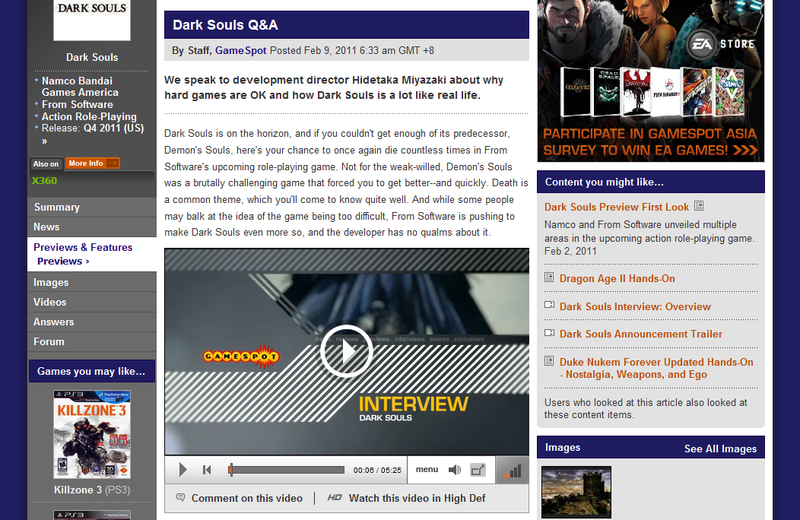 He has taken on roles of Director, Producer and Game Designer for Dark Souls. "With a new publisher, however, it seems likely that the name change is a political one rather than a creative one. 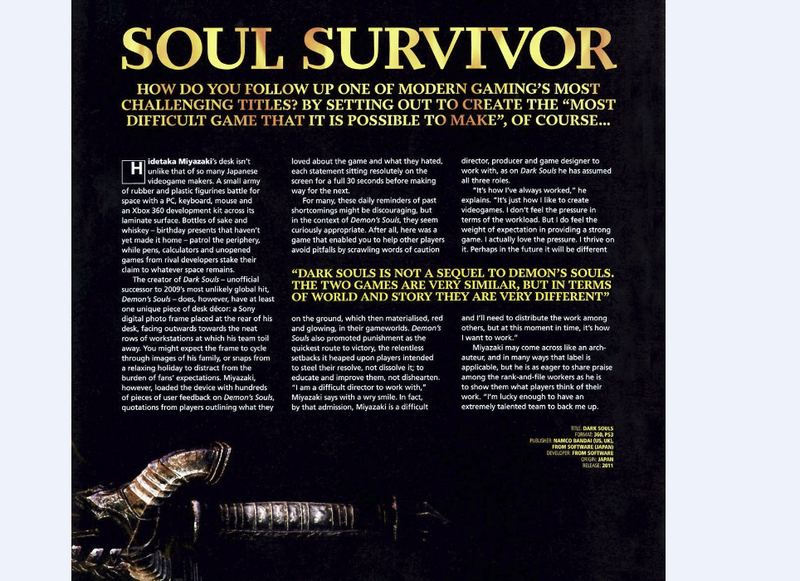 Regardless of how the developer spins it, the facts are that work began in Dark Souls immediately after Demon's Souls was released, that 80 percent of the team is shared between the two project, including all the lead roles, and that, beyond similarities in character and enemy design, even the typefaces used in the loading screen are identical." "From [The] starting point, a variety of game areas blossom outwards, ranging from whispering, mist-covered forests through to high fantasy in addition to flat, smooth concrete and resolute obelisks." 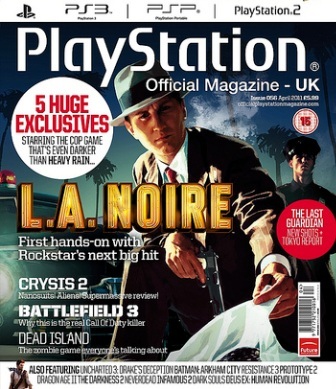 "Every game area takes about six months to complete. So the investment of time, energy and money in each is significant." "The team is hoping to eliminate all loading screens from the game (apart from when your character dies) in time for launch." "One of the core differences between Dark Souls and Demon's Souls is that the earlier game focused almost exclusively on battle and swordmanship. (explains Miyazaki)... I want this game to focus far more on the RPG aspect, especially with regards to rewarding player exploration. In fact, collaboration and exploration are the key concepts for the game." "We have five key criteria on which the difficulty level is judged. We want any player to be able to clear any obstacle simply by learning from mistakes and paying close attention. Then, the reasons for failure must always be clear and understandable. Every problem must have multiple solutions, so that players can tackle it whichever way they want. The game's controls can never be a factor from which difficulty is derived. And finally, we want to make sure that there's the possibility for miracles to happen; those magical moments that spread stories outside of the confines of the gameworld." "It is now possible to assist other players by lighting a beacon of sanctuary in the gameworld and leaving recovery items ther for other players to visit in their own campaigns, sharing assets and items." "A new ability to disguise yourself as an inanimate object within the game world, and hide via transforming into, for example, an innocuous-looking broom or barrel." "One player might be tasked with hunting down a certain item that another player has in his or her possession." "The characters that you play as used to exist in the human world... but somehow they were cursed and made undead, and transported to a different dimension, a third world, the world of Dark Souls. In this dimension characters have their own individual goals that they are pursuing, be it to find their way back to the human world, or something else." "If the mind becomes too far gone then the character will become a zombie or a monster." "The heads up display looks nearly identical so guessing button configuration will be similar." won't be broken down into smaller levels but exist as much larger open worlds." "...we're able to leap down from heights onto huge enemies to unleash powerful strikes on them. Should our timing be perfect, that is." "In terms of story, Miyazaki shed very little, but we know it involves knights and vampires (and that we could assume both these roles)." "When speaking of the game's setting, Miyazaki often referred to "chaos," the differences that cause it, and overcoming those differences to defeat it." 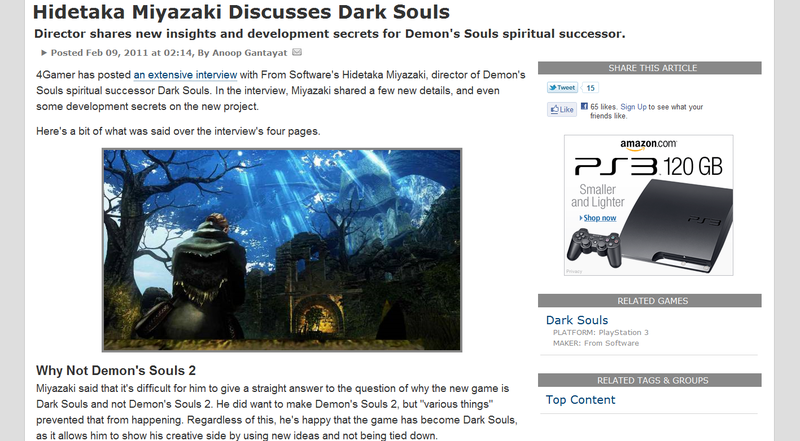 Miyazaki quoted as saying, "I'll create the games I want to create; games I feel users will enjoy. That's what I do best." The staff at From working on Demon's Souls is largely comprised of individuals who also worked on Demon's Souls. They feel a "passion" to "achieve the best." "Miyazaki wants the players to experience tens of thousands, or millions of deaths." "The combat remains largely unchanged from Demon's Souls, while the team concentrates on improving the elements of role-playing and exploration." "You are no longer [able] to pick a character class from the start. Instead you are allowed to equip any armour or weapon you like, prising the potential for customisation wide open." "There are over 100 weapons, and players will be able to cycle through them in real time. A wider range of magic spells is also available." "Miyazaki is careful to point out that the game isn't truly open-world as some media outlets have reported, but it will be less compartmentalised than Demon's Souls. There's still a hub - a campfire within a ruined castle - but you'll be able to leave through your choice of exits and work through the interconnected levels. We're told that you'll be able to travel to any location you can see in the distance." "Secret routes and locations have also been discussed. From Software inadvertently reveals one to us in a place aptly named Trap Road"
"Player death does not have him transform into a ghost, but instead he finds himself in an alternate part of the area and discovers a tunnel to a secret location. Miyazaki is keen to point out the tunnel leads to an even harsher environment as punishment for slipping off the rail and dying." "We are trying to provide an experience one or two steps ahead of what we did for Demon's Souls." "Dark Souls introduces mid-level bosses that can pursue you in unprecedented ways, leaping over walls and climbing buildings to reach you." The Harsher, Deadlier //Dark Souls// is also a More Beautiful Horror Adventure !!NEW!!
" Dark Souls feels like a more refined, better produced, more mature Demon's Souls—not just a sequel with the difficulty knob cranked to 11"
"Namco Bandai reps referred to as "The Trapped Castle"—the game called it "Sen's Castle"
"Gone is the hub world of Demon's Souls' Nexus, partially replaced by campsites known as Beacon Fires. These fires are the safe zones where players can heal and share their experiences with other players." "Sen's Castle should be thought of as a long sequence of death traps. Darts fly from its walls from all directions. Elevator shafts are capped with spikes, making damn sure you better get off on the right floor or suffer the consequences." "The castle is guarded by snake warriors. They're humanoid from the neck down, with long serpentine necks that stretch their height to eight or nine feel tall. Those snake-men attack with sword and shield, moving quickly and relentlessly." "As in Demon's Souls, players can strike one-handed, with light or heavy attacks. They can switch to a two-handed mode, putting away one's shield, for braver battles. Parry, riposte, critical strikes, blocks and rolling dodges—they're all here, all seemingly unchanged in their effectiveness. Demon's Souls players should feel at home in this game's hand-to-hand fights." "the knight I was shown, a "special kind of knight," is just one of the game's starting classes. The only other mentioned was a witch. The equipment our knight wore included the previously mentioned armor, a large class sword, otherwise nondescript, and a pointed shield. That large sword had at least one secret ability—it could cast spells." "It appears that some weapons will have the ability to behave magically, with this one casting a fireball spell and an area of effect attack that emitted a crimson burst." "As back up, the knight had at least two more weapons—a large, gnarled hammer that reminded me of Garl Vinland's Bramd and a thorny bluish sword that looked as heavy as a Meat Cleaver or Dragon Bone Smasher from Demon's Souls. Flipping through the redesigned and far more attractive inventory screen, it looked like the standard equipment was here. Gauntlets, helmets, rings, leggings, inventory to hold grasses and other consumables were all seen. Yes, you'll be chomping on grasses and downing spice in Dark Souls, just like its forebear." "One new aspect of Dark Souls will be the option to upgrade one's armor with materials, an option previously limited to weapons and shields in Demon's Souls." "In Dark Souls, you're already dead, with your appearance fluctuating from human to more corpse-like, with that Humanity characteristic having some unexplained impact. Namco Bandai reps said that players can "give some of their humanity" at Beacon Fires"
"Online modes will feature similar online mechanics introduced in Demon's Souls, with players able to visit and invade each other's worlds, leave them messages, either helpful or malicious." "Based on comments from Namco Bandai reps, the online cooperative and competitive modes in Dark Souls don't appear to be changing drastically. Players will still be able to meet up with other players, mostly strangers, online to work together. But they'll still be working independently in a sense, relying on their own skills, spells and equipment." The origins of the character only affect its starting equipment, allowing for growth in any direction the player wishes. You progress by traveling far from your homepoint and locating a new base. The main character is "Cursed by Immortality"
Even though the body revives after every death, the brain continues to slowly fade, with only death awaiting. The lore and story will be very deep for those who take an interest, but equally unimportant to those who just wish to become strong and fight. There will be events involving NPCs, however in line with Demon's Souls they will be vague and only spotted by the observant. International success was welcome and well received, however whilst the developers are willing to change color palettes or user interface, they have no intention of western-tailoring the game. Featured System, Bonfire: Conceived as a mobile home-base on a vast field, these camps are scattered throughout the land, and players must explore to discover them and select them as their home location. This will be the place where players are returned to upon death, and the resting area to recover HP. You will be able to see the white ghost of other players who are in their worlds but in the same area when you are by a bonfire. Featured Strategy, Kick-down: With a varying terrain that ranges from vast openness to confined tunnels, the player will find situations where he must escape pursuers by climbing. The new and aggressive AI will follow the player even up stairs, however we are given the option of kicking them down to make our escape. Featured Tactic, "Iron Body" Magic: When the warrior casts this magic, his body becomes hard and heavy as iron, thus not taking damage or staggering from enemy attacks but losing mobility to the lowest possible speed. This will surely be a tactic to use in well thought-out situations only. Won't let you catch your breath: Introducing a boss that, at a glance, looks so incredibly difficult you might already fall into despair. After a long journey of repeated hardships, and as you barely reach the end of the road, you are faced with a giant, ferocious enemy who is ready to battle you. You should prepare yourself accordingly if you are willing to step into this world. Besides the story elements which Miyazaki wishes not to spoil, the main character being an Undead brings an allegory: You die, die and die again, yet you get up and face the challenge over and over. There are two possible variations to the ending. The Hero will see a meaningful path ahead, and will be able to chose freely. However the studio wishes the game's ending not to be a goal you must strive towards, and wants fans to enjoy all aspects without hurrying to the end. The main character is not alone, and the amount of NPCs have increased from Demon's Souls, however you will see undead companions and the like, and you won't talk to many often, keeping true to the fantasy theme that requires certain mystery. "We intend on providing challange to both the new character and the experienced one on his second playthrough"
Roleplaying will feature "Oaths" (Vow, contract) that the player will undertake with certain (religious) factions in order to obtain equipment such as a sword. This oath will then determine the player's position or allegiance in the world, which affects multiplayer and the player's relation to other players. This does not refer to a guild or a clan, since there is no social communication per se. It is a system designed to allow role-playing and that will place the main character on different multiplayer situations. It could be said it is akin to Demon's Souls in that aspect. The oaths are hidden at the beginning of the game, encouraging players to explore and discover, as Miyazaki wants players to find their own faction and the right moment for claiming allegiance at their own pace. He also mentions there are some "very rare" oaths for players to uncover. The oath will not affect the main story strongly, as Miyazaki believes role play necessitates freedom. As such, the system is flexible and you can claim allegiance for a while to gain weapon and then return to being free. This also reflects the natural character progression, as players will unveil new aspects and understand the world better, which will change their world view. There will be summon signs [previously soul signs in Demon's Souls] that allow co-op and they will feature "special" signs that summon NPCs instead of players, with Miyazaki's goal being that you don't know if you are playing with AI or a real person. The Bonfire system was created with the aim to find a balance between the players who had accrued 99 herbs and would not find the game challenging, and those who run out and were stuck. The fire was inspired by King's Field "Springs", but a campfire was more appropriate as a place of comfort and rest in the dark and harsh world of Dark Souls. The game is rather big for an Action RPG, and aims to expand on the basics to make them as enjoyable as possible. Miyazaki explains he prefers to deepen exploration and giving those who explore a greater reward for their efforts, making each discovery truly worthy of the time invested, rather than inflate the action. The team strived to balance Heavy Armor usage to provide a true feeling of weight behind it. You might be slower, but your attack will hit harder. There are many different armors to enrich both gameplay and roleplay (through cosplaying), and the studio has tried to use enemy armor as often as possible. There is still a need for balance, so the usage will match gameplay. The variety of weapons has not greatly increased, however the depth of each category is significant. There are peculiar weapons that will take time to understand and use, or that are necessary for strategic play. The game's data has been mostly finalized, and now they are on consolidation and review phases. The studio works hard to please an eager fanbase, using stoic development methods that are reflected in the mood of the game itself. The developer hopes players won't immediately read a guide or wiki and instead enjoy discovery and challenge. 1. One of the many traps of the dungeon. You will have to evade the hit at the last moment, and you will take massive damage if you fail. There are numerous traps awaiting you at every destination. 2. This is not a place where you can let your guard down. If you are not paying attention, a giant boulder may come crashing on you! 3. Carelessness signifies death in this world. A set of spikes that come down from the cieling, there won't be a return from being skewered. 4. It is not only traps awaiting you. Enemies will block your path in narrow bridges, but you could kick them off and avoid the battle. 5. If you aren't alert, you may find unexpected things happen, such as having a giant boulder hurled towards you from afar. A hit would mean certain death. 6. Clear the traps, and meet the enormous boss at the end, Ayan Golem, for a gripping fight. 7. In the underpaths of the realm, a place without sunlight and the strong stench of death, you shall be attacked by multiple enemies. A single moment of rest could mean your demise. 8. Enemies bite onto your feet, you had better watch where you are going and have fast reactions! 9. A headless Stone Demon, laying in silent wait within the depths of the dungeon. Why is it here? What is its purpose? We know not. 10. Enemies wield long weapons in the basement, where it is dificult for you to dodge due to narrowness. Choosing your weapons accordingly will prove effective for your survival. 11. A dark, rotting dungeon where all glimer of hope has been lost. What could this mean? 12. The use of lightening in the Nigth Forest makes it harder to find landmarks and establish one's location, making it easy to get lost. 13. The player arrives at this northern point, surrounded by snowy mountains. Where do you go from here? 1. The searcher of the "King". With a Big mouth and a long neck, is it friend or foe? 2. Big Hat: A wizard named after its characteristic hat. How will it be involved in the story? The mystery deepens. More than 20 areas in the game. Areas are described as places where the name is displayed when the player enters it. There are bonus areas that have no impact on the story and are not required for progression. One such area features a hidden covenant. Three status effects in the game: bleed, poison, and curse. Curse is described as very bad, so it would seem to be the replacement for plague. You cannot reverse stat point allocation. This was the case in Demon's Souls as well, though you could do it through some exploitation of Soulsucker. Weapon forging can add elemental effects. You can find a "giant bow" that fires arrows as large as spears. There's more than 60 spells and miracles in the game. Humanity can be acquired from humans, enemies who used to be humans, and some items. Humanity affects item drop rate, resistance to curse, and also the effectiveness of a few select weapons and effects. Seems like it replaces luck in some ways. You must have humanity to summon phantoms to help you. You can gain humanity by helping others in co-op. Sometimes you can gain additional benefits based on your covenant choice. One new miracle of note is one that allows the player to "request aid". Casting this miracle allows you to see more messages from other players. 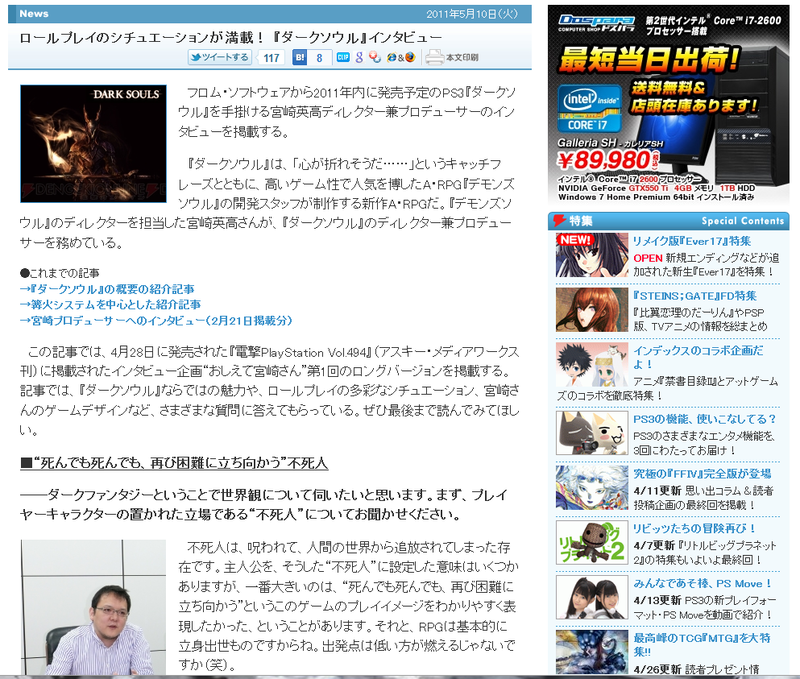 Famitsu interviewed Director Miyazaki. Lots of interesting information about the classes, magic system, forging system, multiplayer, and a little about the gameplay. Some slightly conflicting information about Undead Form, since they had stated at one point that there was no Soul Form equivalent. It is also implied that you can choose your Gift, rather than it be particular to your starting class.